Welcome to the haunted hovels section of Haunted places in North Dakota. Please select a link below to view information on that location. Please note that this section is always growing and new locations will be added when time permits, so please check back if you don't find what your looking for. Alternatively, if you know of a haunted location that isn't in the list, then feel free to send me a message in the contact section and I'll will make it a priority to cover it for you. But for now, please enjoy what information has been provided. Not only is this a a fine place to dine, Georgia's and the Owl is home to several ghosts. A small boy has been reported to be seen to run around the restaurant, while playing and bumping into people. On more than one occasion people have heard music and voices. Crisp packets that are clipped to a rack have been found thrown on the floor when the restaurant has first been opened for the day. A team of investigators have conducted extensive investigations here and has recorded some strange muttering voices. This building wasn't always a bed and breakfast, it used to be the first school house in North Dakota, in the early 1800's. It is said that there was a fire started by a coal burning stove in which the Superintendent (who smoked cigars) died in along with a young school boy. When renovations started to turn the old school into the bed and breakfast, the workers begin tearing down things that needed repair, then things started happening such as objects vanishing and moaning. Lights flickering on and off and a light would turn on in the cellar that when they tried to turn it off it would not go off. Also when working one day they smelled cigar smoke, none of the workers were smokers, so they went to see what it was. In the cellar there was smoke in the air, coming from a cigar that was still hot. Once they started replacing things gradually things got better. Witnesses report feelings of being watched, cold spots and sometimes they have felt the hair standing up on the back of their neck. The story says that about 10 years or so ago, a janitor had died of natural causes in the middle of the night while cleaning and was found the next morning. Since then, strange occurrences have happened with nobody being in control of them. At night people have heard strange noises and felt the hair on the back of their neck standing up. This usually happens when they are there alone. A female chef that used to work there around the same time as the janitor has since passed away and has reportedly been spotted in the kitchen and could also be a part of the occurrences. There have been many strange reports about things happening on the 3rd floor of this building, most believe that it has to do with a man who hung himself from a heating pipe during WW II. In the basement people have felt the hairs stand up on the back of their neck, also a strong feeling of fear forms in the stomach and the 'fight or flight' instinct kicks in, with most people leaving the basement in a hurry. The presence and sense of evil is much stronger in the basement than on the third floor which seems to have a separate entity occupying it. In the 1920s the 4th floor attic in the building which was built in 1901 used to house the dance room. Nobody knows exactly what happened but one morning the janitor found two people dead. The investigators suspected it to be a double homicide. After that incident the ballroom closed and has been turned into a zoology lab, until 1960s when it was closed off because of unstable floorboards. After that students have snuck up there and held séances. They report strange feelings of something there and not being alone. This building was erected in 1951 as the parochial high school. There were reports of a few strange happenings. A teacher that was working late one night says they heard footsteps in the hall and looked out and saw no one. 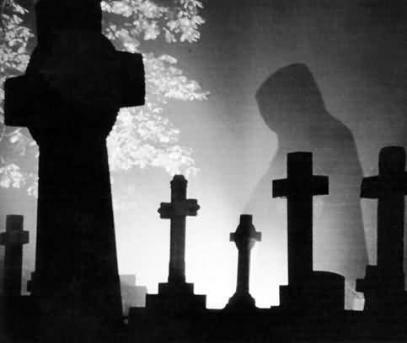 In the gymnasium an electrician was working on an air-conditioning unit that was underneath the bleachers when he looked up and saw a hooded figure float from one wall to another. A young lady was working at night cleaning on the third floor for two nights. And on both nights she saw a girl come out of a closed door in the hall and go right through a picture on the opposite side. For some reason all of the ghost activity has been seen around the theatre. Soon Shanley high is to be torn down and turned into apartments. Trollwood is currently home to the performing arts school and has had several ghostly reports. It was found to have been the home of a pauper's cemetery and there are three locations where people are still buried. These have now been marked with small stone monuments. The most common occurrence is that the ghost of a lady has been seen dancing around a willow tree while the students are performing or music is playing. She appears to be blue/grey and in 19th century dress. There have also been EVPs recorded and the voice of an old farmer that used to reside there is heard telling people to get off his property. Others report the feeling of being followed, also seeing people walking around that aren't there when they look again. There are also reports of people hearing voices calling and being 'touched'. This very old home was built in the 1950's. Richard Luger and his family lived on the main floor and the rooms upstairs numbers 1-6 were either rented out or just for one night stays. Luger would often get complaints about room number 4. They always said they saw a little girl in a white gown with long curly hair standing at the foot of the bed at night. They could also hear her giggling during various hours of the day. She would also move things, make things fall over, or open the closet door. Luger didn't know what to tell his guests. His grandfather had built the house, Richard didn't know of anything like this happening in the past so he couldn't explain. His daughter now sleeps in that room, her sister who sleeps in room number 6 has claimed to see that little girl run past her room and into room 4. She would walk in that room and see nothing except her younger sister asleep in her bed. It is also said to be haunted in the basement by a man, an old woman, and two women. You never really hear or see the man or old woman as much as you can hear the two women talking. The staff elevator makes several runs per night, often empty. Many staff members have claimed to have seen the elevator open on their floor and have caught a glimpse of a figure inside, strange, unexplained shadows set off the door alarms in the psych ward. When watched on video camera, the shadows appear to slide under the door and reappear on the other side. This building used to be a convent for nuns. It was left vacant for several years and people have seen a figure of a woman in the bell tower windows. It has recently become a nursing home and the bell tower is sealed off from the residents. The figure is presumably Sister Mary Murphy, who threw herself from the tower in 1978. There are several reports of an apparition of a torso of a young girl that is accompanied by electrical problems, TVs and lights shutting off. The dorm complex that consists of several buildings is now connected by partially underground tunnels to a dining center. Several students have reported to have witnessed an apparition of an arm laying on the floor out of a doorway in the second floor graphics darkroom. Each student described is as a man's arm, appearing periodically throughout the year and visible both during the day and night. A professor conducted soundings of the building and discovered abnormalities on the second floor, tracing them back to the darkroom film developing closets. Most students, without any knowledge of the ghost's existence, report a feeling of being watched and a brooding presence. Other students have experienced a floral perfume scent wafting through the second floor computer lab during down times for the school, and also experienced a sense of being watched. This second ghost moves throughout the computer lab area, and causes small breezes in a air controlled room. A 16 year old male was found hanging in the building during its construction, it is thought to have been a suicide. Noises have been heard coming from the swimming area locker room, and wet footprints have been found on the concrete walkways in the morning, even though the building has been closed for the night.